It’s been a while since I wrote about being awesome and I had kind of figured I’d exhausted all the ways I could come up with. But recently one more came to mind. Early in my teaching career I hated making mistakes or being wrong. It was highly embarrassing to me. I think, subconsciously, I had an idea that teachers needed to know all the answers and be totally on top of things. Fortunately I outgrew that. I am happy to share when I make a mistake in the classroom. This might be as simple as putting something in the wrong order on our daily schedule or saying we have the wrong special. I’m willing to admit when I mistake something in our content – make a computation error or say something happened in one ancient culture when actually it was another. Saying I was wrong is no big deal to me now. I don’t think this is something that happened deliberately. Over time I simply became more comfortable with making mistakes in front of others. I guess if you do something enough it really does get easier! I’m grateful for this change because I think it is an important thing for me to model for students. If mistakes are no big deal for me to make, they might not be a big deal for them to make. Seeing adults make mistakes, accept them, and move on, is important for kids. Seeing me not be embarrassed by it is also helpful. I hope (and think) it makes our room a more comfortable, welcoming place in which we can all take risks. Hand in hand with this is another thing that has changed for me over the years. I am willing to apologize to kids. Again, it can be as simple as calling a student by the wrong name or telling them to do a job they already did. Sometimes it’s because I chastised a student for something and then realized I was wrong. 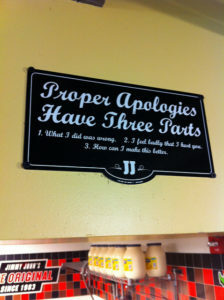 An apology there is critical. If my mistake is public, my apology is public. I want my students to see that I truly do value them and care enough to make things right when I’ve screwed up. When I call out a student for misbehavior or rudeness or breaking a rule (or whatever) and realize I am wrong, often because a kid lets me know I am wrong, I have to stop right there and tell them I am sorry I called them out. I have to let them know that I was in error, that I KNOW I was in error, and that I want to fix that. If we want our children to make mistakes, to learn from them, and to apologize when they’ve messed up in a way that could hurt another then we have to do the same. We can’t act as though we never make mistakes and never need to apologize. Our kids need to see us do those things regularly.